“On Reading the Application” is a recurring series that goes behind the scenes of the Admissions Office at Bard College Berlin. This week, we’re speaking to Salome Vacheishvili. Salome is Admissions Counselor and Recruitment Coordinator for Bard College Berlin, a Bard College Berlin alumna, and a Gemini. As Admissions Counselor and Recruitment Coordinator, Salome not only reads applications but travels the world to meet with prospective students and college counselors. In her free time, she loves to swim, read fantasy novels, and eat delicious food. According to Salome, Berlin’s best pastries come from Du Bonheur, its best Georgian food can be found at Schwiliko, and its best burger is at The Bird. Salome will be in Germany, Georgia, Armenia, Azerbaijan, Bulgaria, Romania, Slovakia, Belgium, and the Netherlands this fall. Keep track of Bard College Berlin’s travel schedule here: Berlin on the Road. I graduated form BCB in May 2017, specializing in both Economics and Politics in the Economics, Politics, and Social Thought BA program. Now I work as Admissions Counselor and Recruitment Coordinator, which is a long and fancy way of saying that I counsel students in all stages of the admissions process. I grew up in Georgia and went to an IB high school. That piqued my interest in a liberal arts education. I was interested in a small university and small, discussion-based classes. Plus, I didn’t want to specialize right away. I first applied to Bard College in Annandale but was excited to learn about Bard College Berlin. BCB meant that I could be closer to my family and in an exciting global city. I loved the small classes and the discussion format, and I was challenged by the foundational texts in different disciplines. I remember reading Kant in my Introduction to Ethics class. That was tough! Another challenge was taking Renaissance Art, which is a Core course. I had never done any kind of visual analysis, and all of a sudden I was analyzing Renaissance paintings and sculpture. I felt totally out of my depth, but it also gave me determination to work at it and to hone my skill. This is exactly what liberal arts does for you — it makes you step out of your comfort zone and open yourself up to gaining the skills and knowledge that you would never have considered otherwise. The BCB education is special. The classes are small, that’s one thing. You can’t hide from the professors. You have to be an active participant in the class. There aren’t many textbooks to study from (unless you’re in a subject that requires it). At BCB, we work directly with primary texts. Instead of reading about Plato, you just read Plato. You’ll have to read, write, and think a lot. You’ll always be taught by faculty, not teaching assistants. You’ll be a part of a community that’s very diverse. And all this is set in Berlin, one of the most multicultural and historical cities in the world. It’s important that the student has considered where they’re applying. I’d like to see intention that aligns with our values and style of education. Bard College Berlin is different, and students have to want a certain type of education in order to really fit at the college. Students should have some sense of the liberal arts. They should want to participate in the community and in the class. So much of the application is standardized. I’d recommend students really utilize the few parts of the application that are not. These include the motivation statement and the sections asking about your experiences outside the classroom, study abroad, extracurriculars, or supplemental information. Those little paragraphs are where students can fill in the gaps, tell us what gets them excited. When filling it out, they should ask themselves: what isn’t in the application? I sometimes see applications where students have a dozen extracurriculars they did for one semester. Often, these are extracurriculars that they think will “look good.” That’s not necessarily impressive (though I understand why students want to make their record look spotless). I’m impressed if I see a student has had a handful of passions for a few years. When I’m recruiting, I get so many questions about our minimum IB score, GPA, Abitur. Students are always surprised to hear that we don’t have a minimum requirement. It’s not that we don’t look at the academics. But it’s more important to see what classes they’ve challenged themselves with than to see their GPA. And, at the end of the day, I’m trying to assess whether or not we can see the student being successful here. We get a lot of different kinds of recommendations. It’s important that the recommendation makes sense with the rest of the application. Sometimes you see a student who’s struggling academically, and then the recommendation is totally, univocally positive. I read one in which a student received a failing grade in a class, but the teacher who taught that class said this student was the best they’d ever had, without acknowledging the failing grade. That didn’t make sense. A recommendation can be positive while acknowledging a student’s struggles. Recommenders should understand (or the students should make it clear to the recommenders) that it is okay to face challenges. We’d simply like to see these challenges acknowledged. I appreciate a student’s challenges if I can see this trajectory in the transcript and in the recommendation. If a recommendation does not make sense, then I do not consider it at all when I make my final evaluation. Ask the person who knows you the best for a recommendation. I’ve seen recommendations for students that have become outdated — that’s no good. Recommendations should be recent, and you should have worked closely with this person. We want them to know you and your work ethic because we want to know that information, too. I do a fair bit of traveling in the fall and in the spring. I remember my first trip: I visited a UWC school and spent a couple of hours talking to students. They were so engaged and had so many different questions about college. 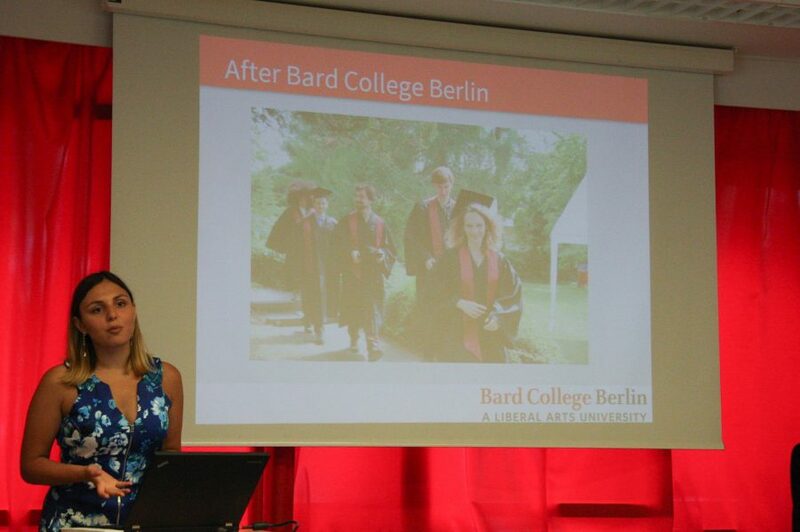 I remember leaving the event and thinking, “Wow, I picked a good job.” It’s rewarding to tell people about Bard College Berlin because it really is a special place. And as we’re such a small university, my job is consequential — I really get to know all of the students in the course of the admissions process. One thing I’m proud of in the BCB Admissions Office is that we communicate openly with applicants. If a student is feeling overwhelmed, or if they have any questions, I encourage them to reach out. We take time for every student — not only if they need help, but also if they have any kind of problem. I have set up so many Skype meetings, campus visits, and phone calls to talk to prospective students. Be genuine. Do your research about the school. When considering college in general, consider the academics, the types of classes you’ll be taking, where you’re going (geographically), and the kind of community you’re going to join. I find that students often focus on academics, but they should keep in mind that they’re settling somewhere for the next four years of their lives: it’s important to make sure this will be a good fit.